All the kings of large empire started bowing down under Akbar's rule but Maharana Pratap never bowed. He faced many challenges and difficulties in life but saved the Hindu Dharm. Such a great warrior's daughter was Champa. Akbar's army occupied the Chottor kingdom. Maharana Pratap used to roam in Aravalli range forests, caves and hills with his family. He suffered above 25 years to save his country, religion independence and respect. In such conditions they had to roam on foot whole day. At nights, ground or hills were their beds. Children had to fast many times. In 3 or 4 days they could find some wild dates or grass rotis to eat. Sometimes they had to flee from the places while making rotis. 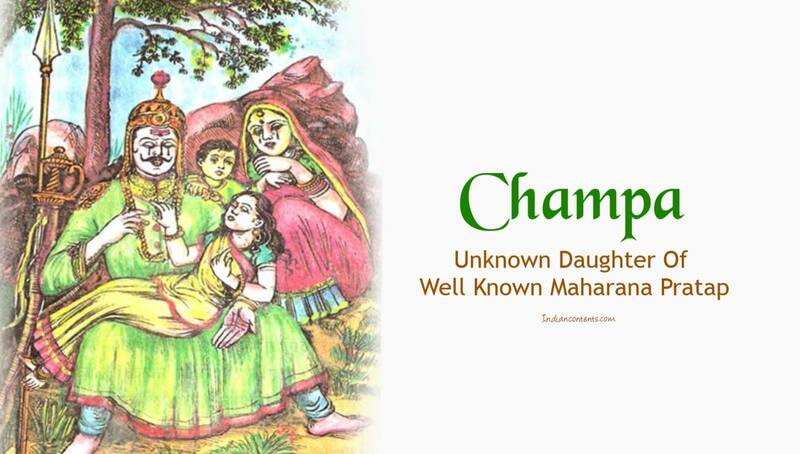 Maharana Pratap had a daughter named Champa who was 11 years old and a son of age 4. One day both were playing near bank of river. Young prince started feeling hungry. He started asking for roti and crying a lot. That small kid had no idea that his parents have no food to give to their prince. Champa started telling stories and some how managed to make him sleep. When Champa with brother in her lap went near her mom, she observed that her dad was in some kind of tension. Champa asked " Dad! Why are you so tensed?" Maharana told "Dear, we have a guest. Such a time came where a guest has to leave hungry from the king of Chittor." Champa said "Dad,don't worry! No guest will return hungry from us. I saved the two rotis which you gave me yeaterday. I am not hungry. I saved it for brother but as he slept now you can give them to guests." Champa gets the two grass rotis saved under the stone. With a little chutney they served that rotis to guests. Guests went away after lunch but father Maharana couldn't see the difficulties faced by his Children. That day he decides to write a letter of surrender to Akbar. 11 year old Champa used to eat grass rotis in 2 or 4 days and sometimes she saved that too. Her part of roti she used to feed her brother timely. Due to this she got very weak. She even fainted the day she gave rotis to guests. Maharana Pratap started crying by holding her in lap - "My dear, I will not trouble you anymore. I have written letter to Akbar." Champa got surprised even in unconscious state. She told - "Dad, What are you doing? You will become slave to Akbar just to save us from death? Are we not going to die one day? Dad, promise me that you will never surrender to Akbar". Champa got silent forever while speaking these words. People say that in Akbar kingdom by looking at Maharana's letter Prithviraj writes letter back to Maharana not to surrender and then Maharana leaves the thought of surrendering to Akbar. But here is a different story where the daughter Champa sacrifices her life to save the prestige of her dad and kingdom. Such were the great daughters of great warriors of our country.